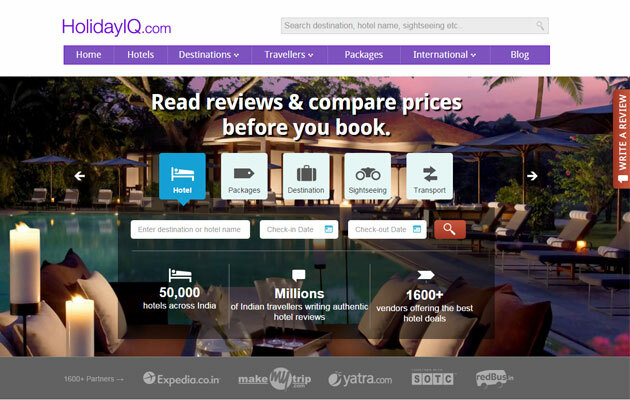 India's top online travel agency MakeMyTrip will buy around 28 per cent stake in Indian travel community and holidays planning recommendation engine HolidayIQ for $15 million (Rs 95 crore), it said on Wednesday. The transaction, which is scheduled to complete this month, values HolidayIQ at around $55 million (Rs 340 crore). The strategic investment will enable both companies to rapidly scale up hotel content and reviews for Indian customers, and provide more compelling offerings to their visitors, MakeMyTrip said. Deep Kalra, founder and Group CEO, MakeMyTrip.com, said, "HolidayIQ operates in a very exciting space in the Indian online travel market. Its pace and appetite for innovation match ours, and we see great synergy in our focus on hotels and mobile. The opportunity to drive scale jointly is fairly significant." According to HolidayIQ, the funds will mainly be used to strengthen its capabilities on content, mobile and product. HolidayIQ was looking to raise close to $25 million (Rs 160 crore) by December 2015 from its existing investors, Tiger Global Management and Accel Partners, Hari Nair, founder and CEO, HolidayIQ, had told VCCircle recently. The firm had raised four rounds of small investments from Tiger Global, Accel and Brand Capital, the ad-for-equity investment unit of media house Bennett, Coleman & Co Ltd in the past, according to VCCEdge, the data research platform of VCCircle. Its last funding happened in February 2013 when it demerged out of Singapore-based OTA Wego and raised around $5.5 million from Accel Partners and Tiger Global. It had previously merged with Wego in 2010. It claims to have over a million holiday reviews from Indian travellers which it expects to increase over the next two years. Hari Nair, founder and CEO of HolidayIQ, said: "Mobile is creating new unprecedented opportunities for growth and innovation. This capital gives us additional resources to expand quickly and strategically and accelerate pace of product innovation. We look forward to working closely with MMT in getting a much larger number of Indian travellers to participate in the creation of Indian traveller opinion." Rajesh Magow, co-founder and CEO-India, MakeMyTrip, said: "This tie-up will power our hotel-growth strategy, and also provide immense value to Indian travellers in the form of user generated and curated trip-planning content. We also expect to rapidly scale our reviews and recommendation engine as an outcome of this investment." Early this year, MakeMyTrip acquired certain assets of Mygola.com for an undisclosed amount and the entire Mygola team joined MakeMyTrip as part of the deal. This acquisition was done through the NASDAQ-listed company's Innovation Fund, which was formed to invest in startup or early-stage companies in the travel technology space. MakeMyTrip had created a $15 million fund in September last year and made maiden investment from the vehicle in January this year by picking a small minority stake in Bangalore-based travel tech startup Simplotel Technologies Pvt Ltd for an undisclosed amount. The HolidayIQ investment was not routed through the startup innovation fund. MakeMyTrip has previously done a few other strategic venture investments such as its bet on Ixigo, without owning them or running their day-to-day operations. It has also been active in snapping a string of assets in the online travel services domain overseas in the past few years.